For athletes to reach the Olympic or Paralympic Games, their development starts right here at home. British Columbia sport organizations joined with the Canadian Olympic Committee (COC) at the Richmond Olympic Oval to celebrate Olympic Day on June 14. Olympic Day is an international celebration of the ideals of the Olympic Games and encourages people of all ages to get moving and participate in sport and physical activity. viaSport, Canadian Sport Institute Pacific, the BC Games Society, and SportMedBC are all lead organizations in the sport sector and were pleased to form a partnership in the name of fun and physical activity for over 3,500 children. Also in attendance were many Provincial Sport Organizations and sponsors, all providing unique experiences to inspire this next generation to participate in sport. In communities across the province, volunteer coaches and local sport organizations start the development pathway for athletes, and viaSport’s mandate is to aid this process by increasing awareness, opportunity and participation in sport across the province – at every stage of life and in every community. Then, anchored by Provincial Sport Organization programs, athletes have the opportunity to train with regional and provincial teams and compete at the BC Games or with Team BC at the Canada Games. Expertise in sport science, sport medicine and coaching certification is also a key foundation for athletes through this pathway. “It is provincial collaboration like this that encourages innovation in the B.C. 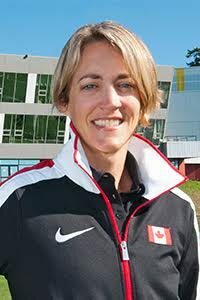 sport sector, as we strive to be Canada’s leader in sport participation and excellence” states viaSport CEO, Sheila Bouman. Olympian Brent Hayden is a shining example of an athlete who was supported by the BC sport system throughout his career from his early days with the Mission Marlins and Chilliwack Spartans Swim Club, through to competing with Swim BC at the 1998 BC Summer Games and the 2001 Canada Summer Games. Sport medicine and sport science expertise offered by the Canadian Sport Institute Pacific and SportMedBC also contributed to his high performance development that lead to his Olympic bronze medal in 2012. The British Columbia sport system provides a critical part of the athlete development pathway and the sector as a whole is looking forward to cheering on our local grown Olympians and Paralympians at the Rio 2016 Olympic and Paralympic Summer Games in August.